HUGE update this week! Lots of new paintings to show you! We're back from London, had a marvelous & very productive time. We're now catching up on emails & orders, etc. Also now getting ready for my next event - November 21st from 4-7pm at Disney's Marketplace Co-Op at Disney Springs (Downtown Disney here in Florida) - hope to see some of you local folks there! Details about the event are here. Next up - super excited to announce that you can now pre-order my COLORING BOOK up at Amazon! It's right here on the USA site, and is also popping up on all the international Amazon sites now too (UK, CA, France, etc.) - just go to your Amazon and search : Jasmine Becket-Griffith Coloring Book and it will find it for ya! Want one sooner? Want an autographed copy? Want to win one for free? Can't find one in your country? No worries, scroll down to the rest of this update and I have even more ways to purchase, including the upcoming launch party on December 12 at Pop Gallery. I have five new paintings to show you! Yep, five. Mostly ones that debuted at my Birds and Beasties show that we have now released online, etc. "Alice and the Audubon Birds" is here , "Birdsong 1" is here , "Birdsong 2" is here , "Faces of Faery 233" is here , and "Children of Lir" ishere ! And finally - my original painting giveaway this month through Patreon is scheduled for November 15th - coming up soon! All you need to do to enter is to sign up for my Patreon group. Subscriptions start at just $1, and you'll automatically be entered. There are also other options including perks like discounts, sneak previews, behind-the-scenes photos, etc. - lots of fun stuff. You can sign up right here (just click the orange "Become a Patron" button and sign up). This month's painting is an Alice in Wonderland piece! My Jasmine Becket-Griffith Coloring Book is now available to pre-order at Amazon here for $19.99 - click HERE to see. In addition to Amazon's US site, it is also up now at most of the international Amazon sites for pre-order too, in the UK, Canada, Germany, France, lots and lots of international Amazon availability. Basically just go to your own country's Amazon page, and search: "Jasmine Becket-Griffith Coloring Book" and you will see it. Yay! Amazon will have the cheapest price and cheapest shipping options, 'cos they are Amazon. They say that they'll be getting their stock in February. As you know, with Amazon, the sooner you get your pre-order in, the more likely you'll be in the first batch they ship out, so go for it now if you can. If cost is your concern, Amazon will always be the cheapest. Don't have Amazon in your country? Just don't want to buy from Amazon? You can also place your pre-order directly through the Llewellyn distributors site here (price is listed in US dollars, but they will indeed ship worldwide and your credit card will convert into your local currency as per usual). Want it sooner in time for Christmas? Want an autographed copy? Want other worldwide options? Read on! *Later this month I'll be giving away three copies for FREE as giveaways through Patreon (worldwide). These will be the very first copies I get myself, my personal copies, and I will autograph them. All you need to do for these is be sure to be a member of Patreon in the next week or two - click HERE to sign up. *Near the end of the month too I will be taking my remaining copies after the giveaway, autographing them, and putting them up for sale at Strangeling.com priced at $29.99+ shipping.. I will only have a few dozen copies at this time, they will probably go fast. These will be autographed, can be shipped worldwide, and will theoretically arrive in time for Christmas, etc. for gifts. I anticipate that these will sell out fast. I will post on Facebook & via mailing list, etc. when they pop up for sale. *I am reserving a handful of my own advance copies to autograph and auction on eBay. These will be auctioned throughout the end of November/December. I will be putting them up as auction-formats (not buy-it-nows) so that if anybody happens to miss the initial launch at Strangeling.com (if it sells out quickly) or isn't able to get one from Pop Gallery, they will still have the option to place a bid and get theirs in time for the holidays. *On December 12th I will be doing a special event at Pop Gallery Orlando at Disney Springs (Downtown Disney West Side) located at the Walt Disney World Resort here in Florida. It's a FREE event, everybody is welcome. In addition to debuting my new "Four Seasons" series of paintings, we will also be doing the official launch/release of the Jasmine Becket-Griffith Coloring Book. Pop Gallery will also be getting in on the Advance Copies of the book, which means that they'll have it long before Amazon, etc. You can totally come in person, buy the coloring book, have me autograph it, and that way you can have it in time for Christmas, etc. too. Details about the event are here. In addition, subject to availability, if you are not able to attend the event at Disney World, you can instead call Pop Gallery on the phone - 407-827-8200 - and reserve an autographed copy from the event. Pop Gallery can ship your book anywhere in the WORLD. So, if the Strangeling.com advance copies sell out quickly at the end of November, calling or coming to Pop Gallery will be your best option to get an autographed advance copy available worldwide. 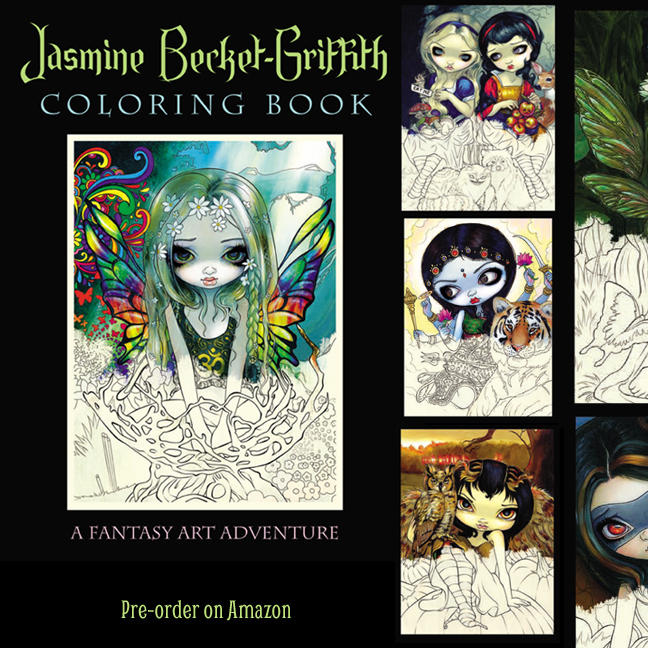 After the February release, the Jasmine Becket-Griffith Coloring Book will be widely available. My friend Paul at StrangelingUK will have them at StrangelingUK.com and will have them for our UK events. I'll have them in stock permanently at Strangeling.com for worldwide shipping of autographed copies after the Februrary stock shipment, as will Pop Gallery here at Disney. I'll bring them to shows & festivals like DragonCon, the KC Renfest, any sort of events like that. They'll be in bookstores worldwide, on hundreds/thousands of online bookshops, gift stores, etc. It is going to be widely distributed. The details above are mostly just pertaining to the Advance Copies which will be coming out before the holidays, for those who want to be FIRST or who want to give them as gifts, etc. The book is gorgeous, printed on high quality paper. The images are "one sided" meaning that you don't have to worry about ink or markers "bleeding through" onto the other side of the page. You can totally cut out the pages too that way without missing anything. There are 55 images in all, 96 pages, introduction from me, details about the paintings, etc. While aimed at grownups, all content is suitable for all ages. If you are a retailer and are interested in stocking the book, contact Blue Angel Publishing - blueangelonline.com and they can point you in the right direction. 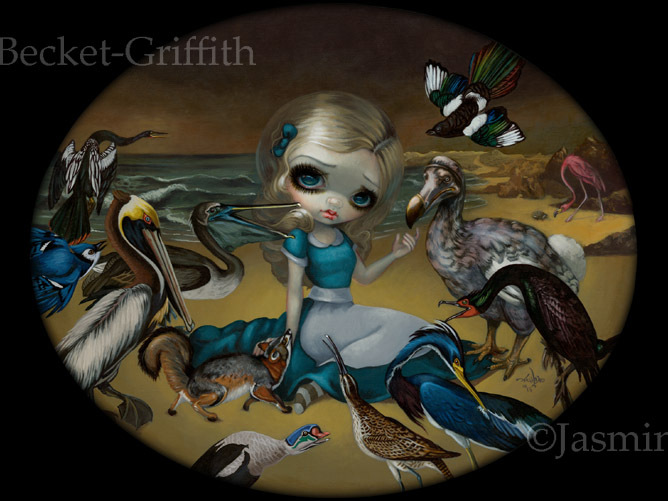 "Alice and the Audubon Birds" - 16x20" Original Acrylic Painting $6000 SOLD - prints and canvases from $13.99 here. Part of my Alice in Other Lands series (which focuses on different artists/movements from centuries past combined with Alice in Wonderland themes) - this focuses on one of the most well-known bird painters of all time - John James Audubon. Born in the 1700s, he was one of the first people to realistically illustrate birds. Lots of lovely birds in this one - the dodo, flamingo (with hedgehog if you look closely), and loads of sea birds! This piece debuted and SOLD at my Birds and Beasties show in Seattle at the Eight and Sand Gallery. Check out Strangeling.com for all the other Alices in the series here. Remember - if you would like to save an additional 10% on your Strangeling.com orders from now on (on all prints & all canvases, including sale items for additional savings) you can join the 10+ level at my Patreon here and get a permanent discount. Click here for details or to sign up. You'd save almost $60 immediately just for one Masterpiece Edition for example, so if you buy even one it is worth it. 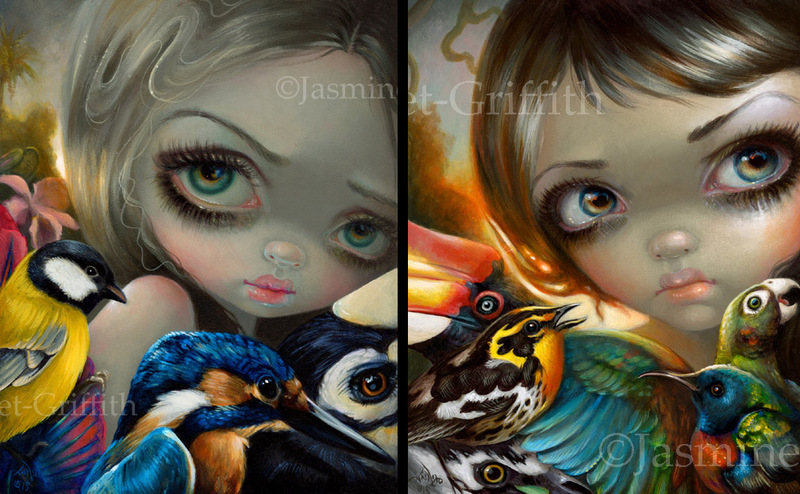 "Birdsong 1" and "Birdsong 2" - Both original pieces debuted and sold at my “Birds and Beasties” show at Eight and Sand Gallery in Seattle. Each is a delicately beautiful painting, showing a pile of some of my favourite, colourful, beautiful birds! We have glossy paper prints signed on the back by me for each painting - 8x10s" for $13.99 and Limited Edition Canvases that are $100, measuring 8x10", hand embellished by me in acrylic paints, signed & numbered out of an edition of 25. All of these prints are available (just use the dropdown menu to choose the fine art print option you want) at my website here . We also have a set of BOTH together for only $20. This is a piece for Blue Angel Publishing specifically for my upcoming "Faerytale Oracle" deck with author Lucy Cavendish. Specifically, it illustrates the Celtic fairytale "Children of Lir." Kind of a rarity for me - I don't often paint male characters, but in the story a little boy is turned into a swan. It's a very interesting fairytale - check it out! The swan design on the girl's outfit is inspired by a William Morris fabric/wallpaper pattern from the 1800s. This was quite a small painting (only 5" wide), but I liked it so much I decided to do a run of full-sized prints of it. 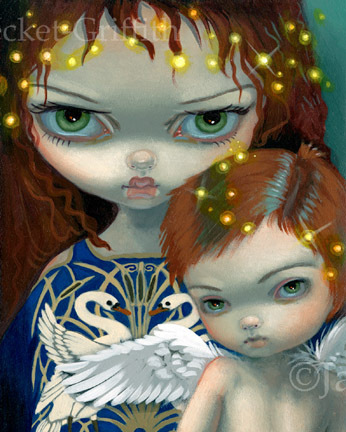 This piece debuted and sold at my "Birds and Beasties" show at Eight and Sand Gallery in Seattle. We have 8x10" glossy paper prints signed on the back by me on sale this week for $9.99, and also 8x10" Limited Edition Canvas prints, hand embellished by me in acrylic paints, signed & numbered out of 25, wrapped on boards & ready-to-hang for $100. All are available on my website here, using the dropdown menu to choose the fine art print option - click here to see! Very excited for the Faerytale Oracle deck! All the illustrations are now complete, and it's all off to the publishers now. I will keep you updated on the release date, etc. as I get more information. Winner will be chosen November 15th randomly from my Patreon members. 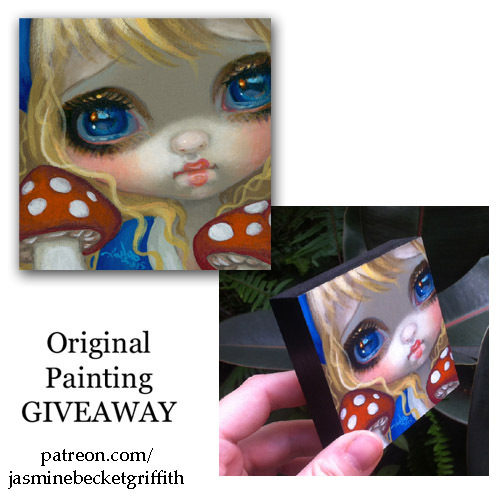 Here is my next GIVEAWAY - an ORIGINAL PAINTING - open to all Patreon members - sign up here - - WORLDWIDE, international patrons are welcome! One Patreon supporter will be selected randomly on Sunday night, November 15 at 8pm EST! It is open to all levels of Patreon subscribers, worldwide, even just the $1 level. She is a Tiny Treasure with an Alice in Wonderland theme - measuring 3"x3" acrylic painting on wood, there is a hanger on the back so you can pop her right up onto your wall! In addition to the monthly original painting giveaways there I'll be doing lots of smaller giveaways like autographed figurines, coloring books, etc., definitely check it out. You don't need to do anything special to enter, I'll just be picking a member up at Patreon randomly. This painting is not for sale, it will be given away, and I will ship it anywhere in the world. Each month a new original acrylic panting will be given away on the 15th of the month. All members of mine at Patreon will be entered automatically, as long as you are a member, you will be entered.